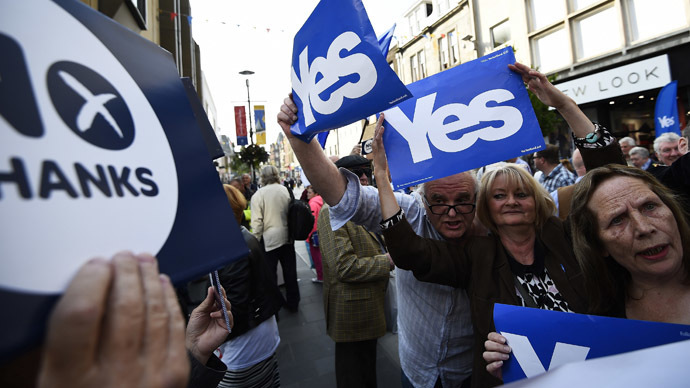 Scottish voters have said ‘No’ to independence from UK. This map indicates where people predominantly tweeted either in favor of independence or to stay in the union. 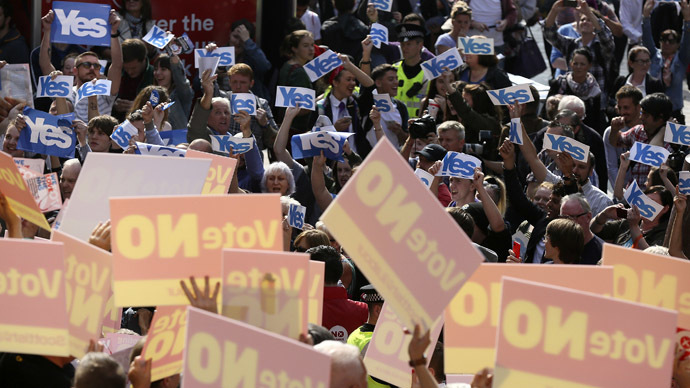 Eleven people have been arrested following a Glasgow 'Yes' voters rally following the Scottish independence results that ran against their interests. Chief Superintendent Andy Bates, local policing commander for Greater Glasgow, told The Scotsman: “More than 700 people gathered in George Square last night and there have been 11 arrests for various offenses including disorder, breach of the peace and vandalism." “An investigation into Friday night’s disorder has begun and an incident room has been set up at Glasgow city center police office, staffed by officers dedicated to identifying and arresting anyone involved in the ugly scenes witnessed across the world on television and social media," he said. 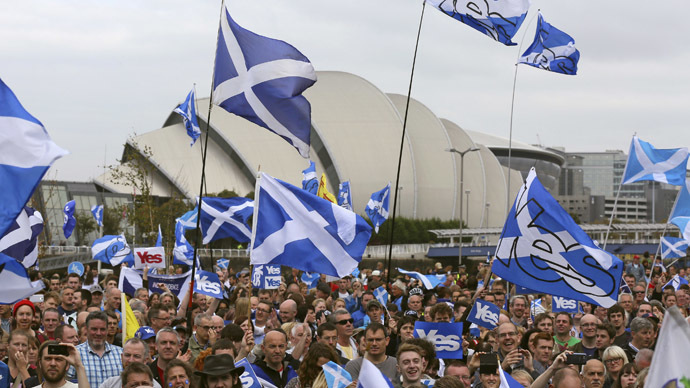 A march of Scotland's independence supporters in Glasgow has been planned for Saturday night, according to Channel 4. Sporadic scenes of violence in Glasgow’s streets are being reported on Twitter. However, local police report “very little fighting or damage and no use of ambulances,” according to Channel 4. Unconfirmed allegations on Twitter said that the offices of the pro-independence Scottish Herald newspaper have been torched, while others suggest a generator has been set alight outside the building. Pro-independence supporters appear to have left Glasgow’s George Square, while about 30 unionists could be seen singing and waving Union Jack flags on RT’s Ruptly agency’s live feed. Police have been cordoning off and pushing back particularly rowdy groups of protesters. Clashes broke out in central Glasgow as rival rallies of union supporters and pro-independence protesters met on George Square. Police struggled to control a mass pro-union rally chanting “Rule Britannia,” which earlier started as a march through the city celebrating the rejection of Scottish independence, according to the Independent. Around 6 p.m., a standoff between the unionists and supporters of independence took place on George Square, prompting police to detain several protesters. Alex Salmond has announced he will resign from the Scottish National Party and as Scotland's First Minister in November when a new SNP leader will be chosen. "It has been the privilege of my life to serve Scotland as first minister," Salmond said. "But as I said often during the referendum campaign this is not about me or the SNP. It is much more important than that. However, he emphasized that he will not retire from Scottish politics altogether. "There are a large number of things you are able to do when you're not first minister or leader of a political party," he said. He concluded his resignation speech in Edinburgh by saying: "We lost the referendum vote but Scotland can still carry the political initiative. For me as leader my time is nearly over but for Scotland the campaign continues and the dream shall never die." The White House has just released a statement on behalf of President Barack Obama, welcoming the outcome of the referendum. “We welcome the result of yesterday’s referendum on Scottish independence and congratulate the people of Scotland for their full and energetic exercise of democracy. 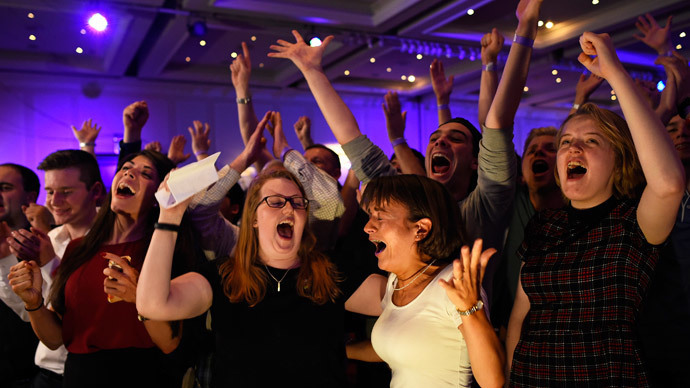 Through debate, discussion, and passionate yet peaceful deliberations, they reminded the world of Scotland’s enormous contributions to the UK and the world, and have spoken in favor of keeping Scotland within the United Kingdom. Jamie Livingstone, the head of Oxfam Scotland, said "Let's build a fairer country." "In the run up to the referendum, people engaged in vibrant discussions about what type of country they want for themselves, their families, their communities and for the country as a whole," Livingstone said. "Over the coming months, we must build on this extraordinary level of public engagement to build a fairer and more equal country which delivers a decent standard of living for everyone, not just a wealthy and powerful minority. "As we know from our work with partners in Scotland, too many people in Scotland - including a scandalous number of children - live in poverty: this cannot continue." The Scottish 'no' vote on independence doesn't seem to be a setback for Catalonia's own separatist movement. The Catalan president, Artur Mas, said on Friday he would sign a decree law to call a November 9 vote on independence from Spain; a move vigorously opposed by Madrid. "I will sign the decree for the consultation in Catalonia, in fact I will call this consultation for Nov. 9 as agreed some months ago with the majority of Catalan political forces," he said.